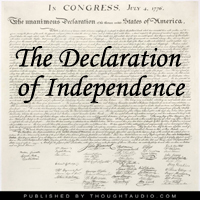 Listen to "Declaration of Independence" on your iOS and Android device. On July 4, 1776 the Continental Congress adopted the United State Declaration of Independence. The document declared the independence of the thirteen American colonies from Great Britain. The Declaration justified the independence of the United Sates by listing a number of grievances against King George III, and by asserting certain natural rights. The document was written primarily by Thomas Jefferson and signed by 56 of the most influential and well known politicians, statesman and delegates of the time including Benjamin Franklin, John Adams, John Hancock and Thomas Jefferson. One of the most important documents ever written everyone should take 10 minutes to listen to this. This is one we all should listen to at least once a year to remind us the cost of freedom!